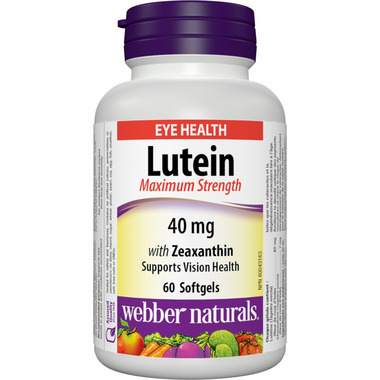 Webber Naturals Lutein Maximum Strength with Zeaxanthin supports vision health. Good vision is central to leading a happy, healthy, and active lifestyle. Some people gradually lose their vision as they age, leading to reduced independence and quality of life. Exposure to air impurities and sunlight can trigger oxidative damage within cells of the eyes. Along with nutritional deficiencies, these factors can contribute to degenerative eye conditions and impaired vision. Certain antioxidants can prevent age-related vision loss, and even partially reverse it. Lutein and zeaxanthin are potent carotenoid antioxidants that are highly concentrated in the eye, where they prevent damage to the retina and its fine arteries. However, it is unlikely that enough lutein can be obtained from food to address eye health problems. Research shows that taking a quality lutein supplement every day can restore blood lutein levels, prevent degenerative eye conditions, and improve visual acuity, glare recovery, and contrast sensitivity. Webber Naturals Lutein Maximum Strength with Zeaxanthin helps prevent age-related macular degeneration, cataracts, glaucoma, and diabetic retinopathy. Non-Medicinal Ingredients: Flaxseed oil, softgel capsule (gelatin, glycerin, purified water, annatto, titanium dioxide), dextrin, yellow beeswax, lecithin. Directions (Adult): 1 softgel daily or as directed by a physician. Caution: Do not use if you are allergic to plants of the Asteraceae/Compositae/Daisy family. Keep out of reach of children. Don't have obvious results such as relief of eye dryness or fatigue, but the service and product delivery of well.ca is always satisfactory. This product (Lutein) is highly recommended for eye care, so I ordered some from Well.ca. I like the format it comes in and the fast and efficient way my order was handled. I had many orders from well.ca before and I always gotten the best of services, and also the top quality in the products.